Xavier Martinez upsets Oscar Bravo with a TKO victory in co-main event! 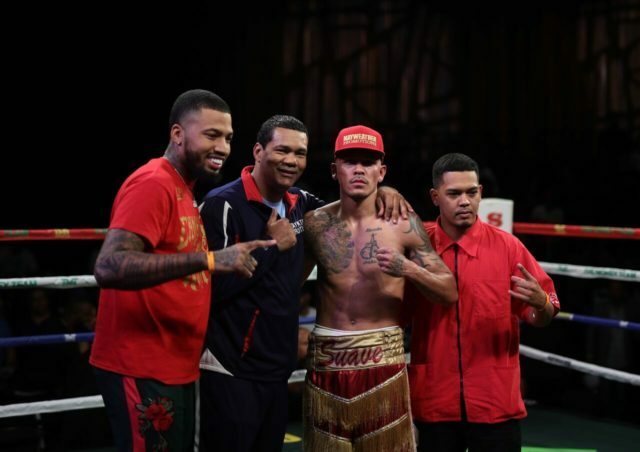 LAS VEGAS (September 22, 2018) – Las Vegas native, Cameron “Suave” Krael, racks up another victory after a 10-round Super Lightweight showdown against Mexico’s talented rising prospect, Jose Borrego, live from Sam’s Town in Las Vegas. In the co-main event, Xavier Martinez scored a sixth round TKO victory over Oscar Bravo to remain undefeated. After 10 rounds of non-stop action, Cameron Krael (14-13-3, 3KOs) came out on top over Jose Borrego (14-2, 12 KOs) to earn the victory. Krael’s speed and piercing power allowed him to land strong shots and counter punches to his opponent. The bout was a war from the start of the first round, as the fighters took little time to feel each other out in the first round before getting to business, and there was no turning back. Krael and Borrego battled into the second round and continued the momentum in the rounds that followed. Both fighters threw consistent combinations and by the middle to late rounds they kept the fans on their feet. Krael’s striking punches, and combinations of body shots and jabs, began to take a toll on his opponent. The toe-to-toe action and exchanges of electrifying blows continued until the bell sounded in the 10th and final round. It was an all-out war and judges scored the bout a majority decision in favor of Cameron “Suave” Krael”. Borrego was unavailable for post-fight quotes. 20-year old unbeaten prospect, Xavier Martinez (12-0, 7KOs), headlined the co-main event vs. veteran contender Oscar Bravo (23-9, 11KOs) in a Super Featherweight battle. Both fighters entered the ring with explosive shots. During the 2nd round, Bravo suffered a cut over the left eye from the exchange of on target blows he received from Martinez. This didn’t stop Bravo’s determination through the rounds. Martinez picked up the momentum and continued dominating in the 3rd round and didn’t slow down. The referee stopped the fight at 2:46 into the 6th round deciding that the fighter was unable to continue, improving Martinez’ record to (12-0, 8KOs). This was the first time Bravo has been stopped in his career. Additional action saw a super middleweight match-up between Lionell Thompson (20-5, 11KOs) and Indiana’s Derrick Findley (28-24-1, 18 KOs). This fight between two hungry and experienced fighters started off very measured with both fighters choosing their shots with caution but turned out to be a full-on brawl. The fighters got the best of one another and applied the pressure when needed. After 10-rounds of non-stop action, judges scored the bout a unanimous decision in favor of Thompson improving his record to (20-5, 11 KOs). Philly’s Christopher Brooker (14-6, 5KOs) got his 14th victory over Lanell “KO” Bellows (18-3-2, 11KOs) by unanimous decision. Ava “The Lady of Boxing” Knight (16-2-4, 5KOs) entered the ring eager to earn a victory and did just that by defeating Nancy Franco (15-13-2, 4KOs) by unanimous decision in a 6-round action-packed bout. Maurice “Ambitous” Lee (8-1-1, 4KOs) suffered the first draw of his career after a hard-fought battle between undefeated Ivan Pandzic (8-0-1, 4 KOs). Super middleweight, Kevin Newman made his return to the ring and improved his record to (8-1-1, 4KOs) with a second round TKO victory over Ohio native, Egerbhert Reed (4-5-1, 1KO). Jose Valenzuela (1-0) made his pro-debut in stellar fashion by earning his first professional victory by unanimous decision over Humberto Tellez (0-2) in a 4-round featherweight bout. In the opening bout of the night, we saw prospect Sevelle Hasan (2-1, 1KO) defeat Kaywann Sistrunk (0-1-1) by technical knockout 1:10 into the third round of a 4-round super lightweight battle.